Managing and maintaining parking facilities presents a challenge to many businesses. A standardized system of signs, pavement markings and other devices is essential to provide the proper guidance and control of vehicles and pedestrians and ensure that drivers can navigate the road network safely and efficiently and comply with the Road Rules. Signage and pavement markings audits are useful to identify where the layout of parking facilities has changed and signage or pavement markings no longer conform to the required Standards and guidelines, are inconsistent or inappropriate in their application. Often they may have safety implications or cannot be legally enforced. IPS has developed a comprehensive signage audit service for clients. 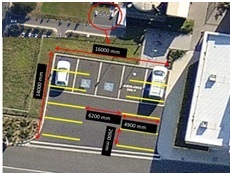 We undertake both manual audits of parking facilities and use high definition video surveys for larger parking facilities to identify and determine that car park signage and pavement markings comply with Australian Standards and guidelines and are legally enforceable. The signage audit service identifies any deficiencies associated with parking features and assets and provides a report with practical recommendations to rectify regulatory signage (i.e. 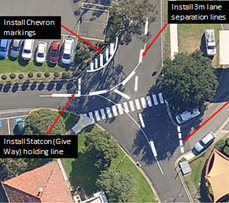 parking control, warning, hazard and directional and traffic instruction) and pavement markings associated with a car park (road) network to achieve compliance and improve safety. Audit findings and recommendations clarify the scope of works required making planning easier. High definition digital video reports provide a simple and efficient viewing of the parking facility’s road and car park network. Vehicle circulation and parking ‘hot spots’ that are cause for incidents, congestion or delays can be reviewed for analysis to determine remedial action. 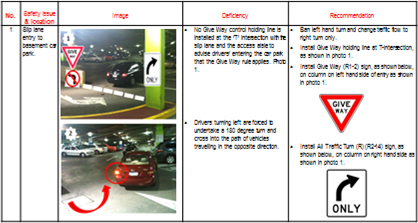 The benefits of digital video car park signage and pavement markings audit is that it provides a driver’s eye view of what a driver experiences when parking at your facility and assist you to spatially identify ‘real world’ features and assets without the need for extra maps, files or reports, all of which may not provide the level of detail that is required. A digital video report can assist in budget forecasting by providing a visual record of car park signage and identify where additional signage and line markings may be required to improve traffic management. To enquire about an audit of your car park signage and pavement markings, contact Integrated Parking Services today.